The development of the recognition respectively the spiritualization. The development of our feelings from compulsively aggressive to ethical lovingly including the social development from egocentric to sympathetic. 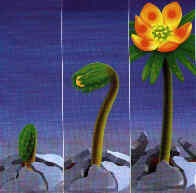 The development of the vitality from numb to vital. b) or affect the development of a single inner aspect. If we take a look at a plant we see the same process. Has our subconscious copied something here or are there valid “cosmic” principles? "I was walking along a path. At first there was a pond in front of me that I had to pass. There were stones laying in the pond and I hopped from one rock to another. Many dangerous fish were trying to bite me and I had to watch my steps very carefully. After I overcame this small lake I had to choose between two paths: one was dark and hard to walk on and the other one was bright and easy to pursue. I knew that I had to take the dark path and so I did.